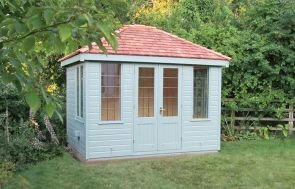 This 8 x 8 Weybourne Summerhouse was designed personally by our customer and was installed in his large garden in Leatherhead, Surrey to be used as an area for watching the wildlife that frequently visits. Built entirely by hand to order using FSC® Certified Timber at our Factory HQ in Norfolk, an electrical pack was included to allow him to use it at all times of the day. 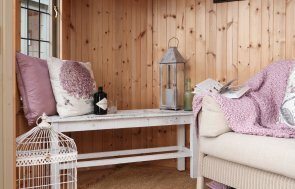 Insulation is included and with the electrical pack and double-glazed windows he added, allows for comfortable use all year round, regardless of the weather. The interior was finished in a natural matchboard lining which creating a warm and inviting interior, with the natural graining of the wood on display. 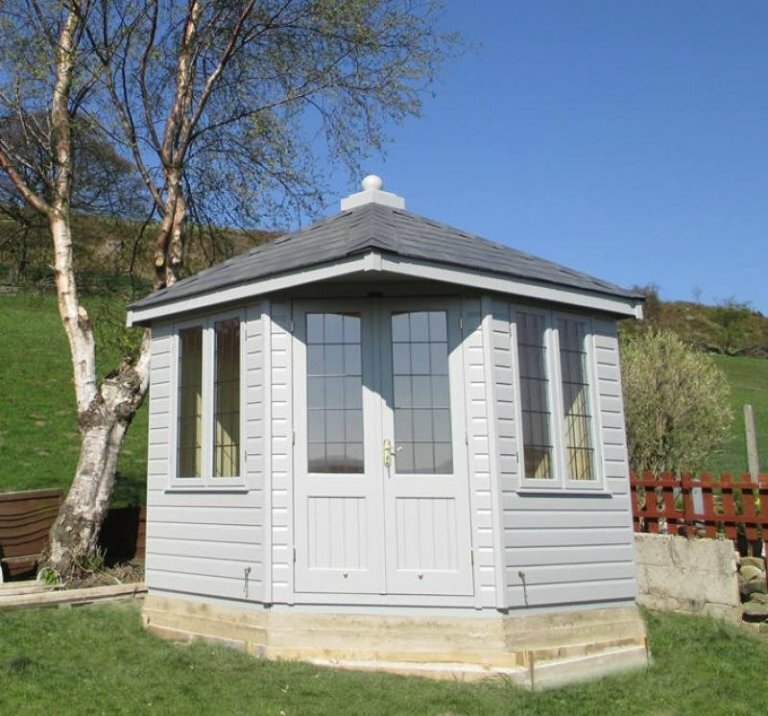 The exterior was clad in our standard planed shiplap tongue and groove cladding and coated in Pebble from our Valtti Paint Range which provides long-lasting protection against all weathers. Grey, slate-effect roofing tiles completed the exterior finish and ensures that ongoing maintenance is kept to a minimum. We have Seven Show Centres situated around the UK, including at Sunningdale in Surrey where you can see more than 40 different display buildings to experience the build quality and finish first hand. 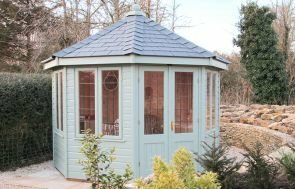 If you would like to discuss how we can create your perfect Garden Building, built to order to your exact specifications, please Request a Callback, Contact Us or call us on 01760 444229 and one of our team will be more than happy to talk through your requirements.